Brexit showed us just how quickly volatility can pick up. But we found several stocks that weathered the storm. Dividend-growth stocks have a history of less volatility than the overall market. We show how the lower volatility of dividend-growth stocks can completely alter (for the better) your retirement situation. Last week's panic in the markets after the United Kingdom voted to leave the European Union has taught us investors a lot of lessons. One of these lessons is that markets might be quiet for a long time, but can burst with volatility at any moment. The VIX, which measures the market's expectation of market volatility for the S&P 500, was up an astonishing 47% in just one day. Which Stocks Were Less Volatile? This was also a good opportunity to look at which types of stocks didn't decline as much as the overall market. The S&P 500 declined 5.5% in the days following the UK's exit. But consumer staple stocks were down only 2.5%. To measure this I looked at Vanguard's Consumer Staples ETF (NYSEARCA:VDC). This ETF consists mostly of solid dividend-growth stocks such as Procter & Gamble (NYSE:PG), Coca-Cola (NYSE:KO), and PepsiCo (NASDAQ:PEP). I was also curious how my three favorite dividend-growth stocks performed. Here is what I found for Altria (NYSE:MO), Johnson & Johnson (NYSE:JNJ), and Exxon (NYSE:XOM). The fact that dividend-growth stocks are not as volatile as the rest of the market won't surprise many readers. Their stable dividend payments mean a less volatile rate of return over time. Also, those dividend payers that fall under the category of consumer staple stocks are generally less cyclical than other companies. In this very informative article the author shows that dividend-growth stocks have volatility levels that have historically been about 33% lower than non-dividend paying stocks. This makes sense because, as I mentioned already, dividend payouts are more stable than equity prices. Because the dividend payout contributes to the future rate of return, the overall price volatility should be less for these types of stocks. Let's take a look at how companies like Altria, Johnson & Johnson, and Exxon can make your retirement portfolio more bullet proof. I looked at two different retirement portfolios in the WealthTrace Financial Planner, which is available to the public. My first portfolio invests in 75% stocks and 25% bonds. All of the stocks are invested in an S&P 500 index fund. The volatility (standard deviation) for the S&P 500 has been about 17% over the last decade. 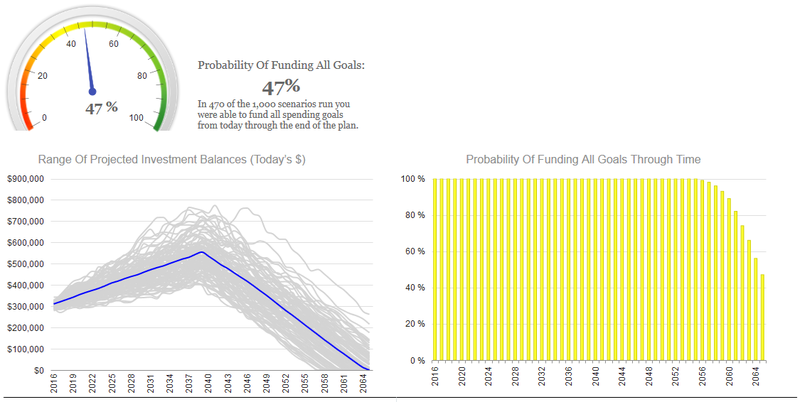 When I ran this retirement plan for a 45 year old couple with $300,000 in investment assets and annual retirement expenses of $50,000 I found their probability of never running out of money to be a woeful 47%. This is a very large jump in the odds of never running out of money. This is why so many investors have bought into the strategy of using dividend-growth stocks for a less stressful retirement. The constant income payments being thrown off by these dividend payers helps smooth out fluctuations in stock prices. In fact, one huge benefit of investing in dividend-growth stocks for retirement, as I wrote about recently here, is that the principal value of dividend-growth stocks becomes nearly meaningless if held long enough because their dividend payments become the major portion of the total return over time. So changes in stocks prices during recessions do not impact investors nearly as much, either monetarily or psychologically. Running dynamic scenarios such as Monte Carlo analysis really helps tease out the risk with a person's retirement portfolio. The analysis shown here today is further evidence that dividend-growth stocks with a long history of dividend growth are extremely important for retirement portfolios and can completely change how your retirement shakes out. Disclosure: I am/we are long JNJ, KO, MO, XOM. I wrote this article myself, and it expresses my own opinions. I am not receiving compensation for it (other than from Seeking Alpha). I have no business relationship with any company whose stock is mentioned in this article.